SO I recently am putting in some new plates and had everything back together in my clutch. Still doesn't work. I start re tightening the bolts that hold the springs in and one of them snapped pretty much at the head of the bolt . any idea how to get it out or should I take the clutch center out and just drill it? also does anyone know why my clutch when in gear and pulled in does not let the tire roll freely, even after the plates were changed. All I can think of is an adjustment issue. If it is one of the bolts I'm thinking, I would back out the other bolts and remove the hub. Then I'd have access to the shaft of the bolt and be able to grab it with vise grips and back it out. there is no where to grab the bolt its sunken in the thread too far. I started to drill it out and relized I need to get the clutch center off (which is now a problem). 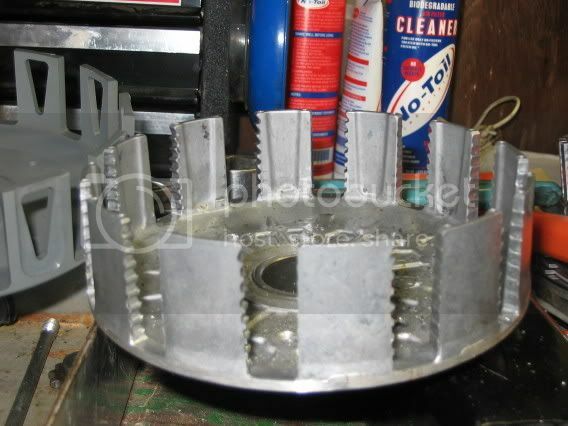 Im going to some plates back in put it in 5th adn try adn get that center nut off. shouldnt the back wheel roll freely when engaged adn the clutch lever pulled in ? like as if it was in neutral? Im really not sure but mayber when I had it back together it was fine then. and then I took it apart and f'ed it up. any information about easiest way to get the center clutch nut off with out actually buying the tool would be greatly appreciated. Sorry one more thing it goes clutch plate then spacer then clutch then spacer etc? also when its back together and the cover is still off and you pull in the lever, how much is the pressure plate supposed to come out? As stated before.....The wheel will not spin freely when in gear and clutch lever pulled as you are turning gear shafts in the trans. That is why they don't start very well in gear as well. Also, if the bolt broke off at the head as stated, there will be enough sticking out of the center hub to get vise grips on. I have the service manual, I found its good for specs but doesnt tell enough "how to" I found you tube was better. ok Im gonna get the bolt out and get a new one and put it back together and see where Im at. the screw was lodged in the 2" thread of the clutch center. I ended up going to Bondi, I pulled my truck up he brought the impact gun out 2 seconds the center nut was off and I just drilled out the broken screw with no issues. Thank god.